By Mike Smith: Former WBC super middleweight champion David Benavidez wasn’t entirely impressed with what he saw of Caleb Plant (18-0, 10 KOs) in his victory over IBF super middleweight champion Jose Uzcategui (28-3, 23 KOs) last Sunday night at the Microsoft Theater, in Los Angeles, California. Benavidez says Plant, 26, looked tired after the first one-third of the fight, and was getting nailed a lot by Uzcategui. Benavidez says when he faces Plant in the future, he’ll have plant running, and that’s he’s going to stop him whether he gets tired or not. Benavidez (20-0, 17 KOs) is convinced that he’s going to halt Plant when the time comes for them to fight each other in a unification fight. “He looked good against Uzcategui, a wide fighter, but what happened after the fourth round? He lost some steam,” former World Boxing Council super middleweight champion David Benavidez said to Fighthype. “When Uzcategui wanted to throw, he was touching him at will. I know how to jab. I know how to use my right hand. I know how to do everything,” Benavidez said. Benavidez is so heavy handed. He would be a huge problem for Plant if that fight got made today. All the things that Plant did to beat Uzcategui wouldn’t help him against Benavidez, who hits hard, and he’s good at cutting off the ring against runners. Plant would have to come up with something different than what we saw in his win over Uzcategui for him to have a chance of beating Benavidez. It would be a really grueling fight for Plant, and he could wind up getting beaten into submission by Benavidez. 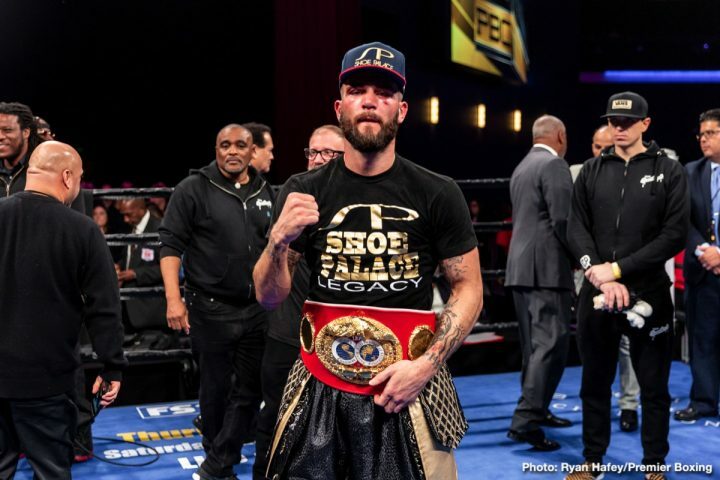 “I don’t think he wants to get in there with me,” Benavidez said about Caleb Plant. “I’ll have him running for his life. I’m knocking him out either way. If he don’t get tired or if he does get tired, he’s getting knocked out either way. When I get my belt back, I’m going to unify asap. He’s been talking so much, so that’s a guy I’m going after,” Benavidez said. Plant seems like he’s not afraid to fight anyone. That doesn’t mean that Plant will beat all the top super middleweights like Benavidez and Callum Smith. It just means that he’s not afraid to fight them. Plant doesn’t realize his own limitations. His was better than Uzcategui last Sunday, but not much better. What we do know is Plant can’t afford to take too many beatings like he did against Uzcategui if he wants to stick around for long. Benavidez will be fighting J’Leon Love (24-2-1, 13 KOs) in a 10 round scheduled fight on March 16 on the undercard of Errol Spence Jr. vs. Mikey Garcia on FOX Sports PPV at the AT&T Stadium in Arlington, Texas. Assuming that Benavidez is successful in beating the 31-year-old Love, his next move will be to go after the winner of the Anthony Dirrell vs. Avni Yildirim fight. If Benavdez wins that fight too, then he’ll look to fight Plant in a unification match if he’s still the International Boxing Federation super middleeight champion by that point. We’re probably looking at Benavidez vs. Plant taking place in early 2020 under a best case scenario. The reason Yildirim, 27, is fighting for the vacant WBC super middleweight title against Dirrell is because he’s won his last five fights since losing to Chris Eubank Jr. by a 3rd round knockout in October 2017. Plant was padding himself on the back a lot after the fight, not realizing that he didn’t look that great against Uzcategui. Plant did just enough to win, but it was far from an impressive performance by him. Plant was moving and holding too much for it to be impressive. Plant got tired, and couldn’t hold his ground against Uzcategui. The fight was interesting for the first four rounds, but after Plant got tired, he start running from the fifth round on. That’s when the fight started to slow down, and it was less interesting to watch. It doesn’t matter that much that Plant had been out of the ring for a year. He was always going to have problems with the heavy-handed Uzcategui. Plant didn’t have the punching power to keep Uzcategui off him or to stop him, so it was a tough fight for him. He couldn’t just stand and fight Uzcategui, because he doesn’t have the stamina, power or the punch resistance to fight him like that. Plant was hurt in the 9th round when he was hit with a solid shot from Uzcategui. he was lucky that Uzcategui missed with his follow up shots after that because he was trying hard to get him out of there with every punch he threw in the last part of round nine. If Plant isn’t scared to fight Benavidez and Callum Smith, like he says, then he should push his manager Al Haymon of Premier Boxing Champions to arrange for one of those fights to happen. Benavidez has already made it clear that he wants to win his back old WBC 168 lb title by fighting the winner of the February 23 fight between Anthony Dirrell and Avni Yildirim for the belt. Dirrell (32-1-1, 24 KOs) and Yildirim (21-1, 12 KOs) will be fighting for the vacant WBC 168 lb title net month at the Minneapolis Armory, Minneapolis, Minnesota. Callum Smith (25-0, 18 KOs) and Benavidez would be a really tough fight for Plant. Those guys are more accurate with their punches than Uzcategui, and they appear to hit harder than him. Plant’s face looked badly swollen at the end of the fight. Uzcategui clearly put hands on Plant in that fight, even though he was missing with a lot of his shots. The punches that did land by Uzcategui, did a lot of damage. Plant was forced to run from Uzcategui in the last four round in order to escape from being knocked out. It’s unclear when Benavidez will be given a chance to fight for the WBC title. He tested positive for cocaine last September, and that wasn’t very long ago. It might take a while before he gets a shot. We’ll have to see whether the WBC will give the green light for Benavidez to fight for the title.